PALEO JAY SMOOTHIE CAFE: PaleoJay's Smoothie Cafe podcast #133- Plan NOW for your 65 year anniversary, and your 96th birthday! PaleoJay's Smoothie Cafe podcast #133- Plan NOW for your 65 year anniversary, and your 96th birthday! That’s right, my mother and father are celebrating two events in one tomorrow- both their 65th wedding anniversary, and the birthday of my father turning 96! I assured him we were, and as we walked away, I saw him shaking his head in disbelief. 3. To have raised 8 children, all of whom are healthy, happy, and graduated from college and working- (except for mois, paleoJay, since I am retired, 64, and only working part time at jobs I love! 4. To still be living at home, in the two story house they have lived in since 1960, when yours truly, their eldest son, was in 4th grade! Of course, to me this is a big deal! But what does it mean to you, oh Paleo aficionado? Well, aside from your massive allegiance to PaleoJay.com, it means that you should try to live as they have lived. 1. My dad walked, and still walks, everywhere. He used to take the train into the city for many years, either walking or riding his bicycle to the train station about a mile away. Then, he would walk to his office, another mile or so away. He used to be amazed at his friends, who would be dropped off at the train station by their wives, and then take a taxi to their office! He really didn’t like it, and like his son PaleoJay, he would try to get them to follow his lead into better habits. Oh, even now, he always parks as far as he can from the entrance to any store he visits. Always! 2. Although not paleo, (no one was back in his day), he always knew that “bready” things were bad. He never tried to eliminate them, but he always knew to minimize the bread, whether pasta, dough, or whatever. Also, remember that for most of his life, grains were the ancient grains of the Bible- the “waving fields of tall wheat”, not the squat, hideous altered high-gluten grains of today. My mother felt the same way, and ate the same way. 3. My parents always ate lots of fruits and vegetables, and woke early. They didn’t stay up late watching television like so many of my parent’s friends, and they always had a vegetable garden. Also, they never put chemicals on their lawn like so many started doing in the 1970’s. 4. They always walked around barefoot in the yard, and encouraged us to do likewise! I think part of this was to save on the cost of shoes, but heck- they did it too! And we all spent most of our free time in the yard. We played games, whiffleball and kickball, we built a monorail, we had a rope to climb- that was where we all hung out- all eight of us! And also, we were the home that our friends wanted to come visit- it was fun. 5. Other neighbors of my parent’s age started moving when their kids (usually one or two at most) moved out from home to go to college. They moved into ranch houses or, (worse in my dad’s and my opinion), into “retirement communities”, where they were entertained and protected from any rigors of living like mowing, or snow shoveling, or- well, anything hard at all! And then, when they were so “softened up” that they couldn’t even get out of their easy chairs anymore, they could easily transition to “assisted living” in a nearby facility. Most of those parents are long gone now, before their time. My parents are still living in their two story, rambling house with a huge yard, and enjoy their upstairs bedroom still, after all these years! “The stairs are healthy!” is one of my father’s favorite refrains, and I even hear myself repeating it after all these years. There are other things my parents did that are Paleo, or ancestral, or else just healthy. They stayed married to the same person. They kept their “tribe”, their large tribe of relations, friends, and the friends of their children and fellow church members close, and never abandoned any. They kept playing and enjoying music throughout their entire lives, and still do. They have always been friendly, and honest, and true to their word! They raised their children well, and set an example that we all could follow to our advantage. They were very conservative, and lived according to their faith. But my parents are still there, look pretty much the same, and smile and remember them all! I will give a report later, but I am expecting a live version of It’s a Wonderful Life. 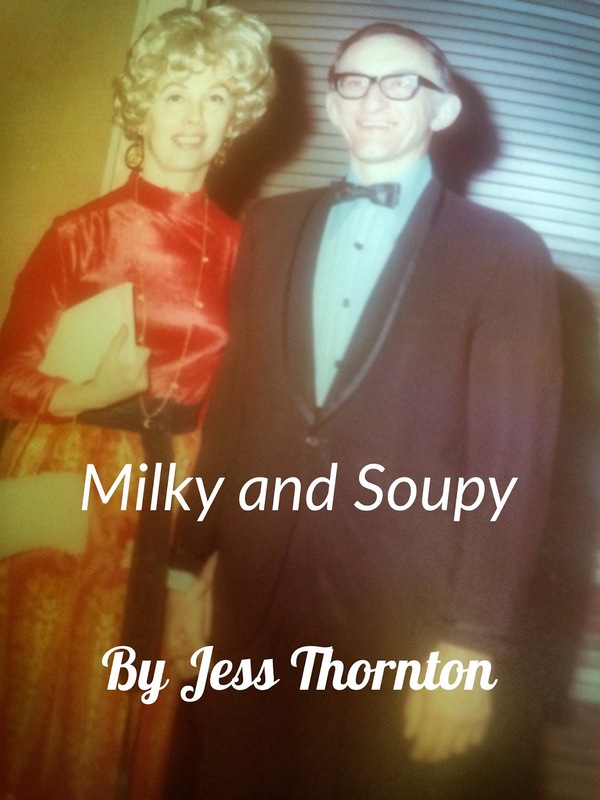 Oh- Jess Thornton is my Pen Name- it's really PaleoJay! Or, you can just get it on iBooks, Amazon, or just about anywhere else! It’s a good read, with lots of pictures!